DoorTek-IS Enterprise is considered a top tier offering by many security providers. It is an optimal choice for schools, large universities, multiple site operations, and corporate applications. It enables you to meet the challenges of today’s integration demands. With DoorTek-IS’s robust and flexible design you can deliver a custom solution that takes advantage of the vast integration options and interfaces to many of the most popular brands of CCTV, IP Video Management, Intrusion Detection, RFID, Perimeter Detection, GPS, Intercom, IP Telephony, and Visitor Management. User Definable Graphical User Interface. Creation tools for Custom Maps and Badge design. Drag and Drop support for Real Time Indication Icons. Pre-define actions to be triggered by an event. Multiple events are processed simultaneously in multi-tasking, multi-threaded environment. Text to Speech and Wave file support to tell the operator how to react to a situation. Alarms can be defined to require Acknowledgement, Comments, or Clear functions. Single click on a point brings up the appropriate graphic screen, displays video and opens audio talk path on intercom for operator convenience. Events from the same point are given a count rather than multiple lines to minimize screen space used. Created historical report on any given point for any specified time frame. 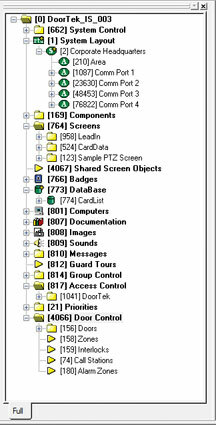 Users define what information is included in the card database reports.